This name in Mäori is the primary one for the tree fern Cyathea dealbata, stylized representations of its frond constituting, along with the kiwi, the most widely used symbol of New Zealand identity. 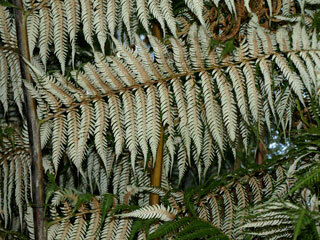 In English it is also called the "silver fern" because of the silvery-white underside of the fronds. Its name, usually mispronounced as if it were "panga" ("punga" in English orthography) is also the generic word for tree ferns in New Zealand English, an interesting reversion to what may have been the source word's original meaning in Proto Polynesian, or perhaps an indication that this was indeed also a subsidiary meaning in Mäori. R&W, drawing on Beever, list katöte (one of the names for a related species, C. smithii) as a synonym for ponga, and ponga as being also an alternative name for Cyathea cunninghamii, otherwise known as pünui. These usages are not recorded in Williams, and are probably local variants for the more widely-used names. 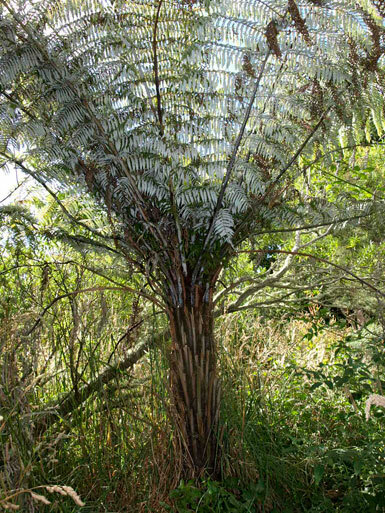 Like other members of the Cyathea family, the stipes and raches (stalks and midribs) of ponga fronds are covered with small scales, in contrast with the hairs characteristic of the Dicksonia species (e.g. 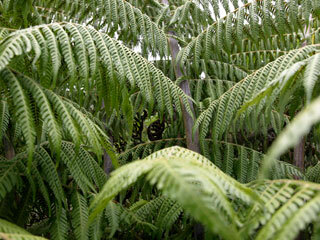 the whekï), the other group of New Zealand tree ferns. As illustrated in the photographs below, the bottom portion of the stipes remain on the trunk after the rest of the old fronds fall off, and there is often a circle of old fronds still clinging to the top of the trunk below the fresh growth. (The trees in the photograph are about ten years old, with trunks around 2 metres high.) The species is endemic to New Zealand, and grows to about 10 metres high; it prefers open dryish forest and shrubland, and is one of a small group of native plants that will grow happily in pine forests. It is at its best in sheltered situations, as regular exposure to wind usually plays havoc with its otherwise highly decorative fronds. 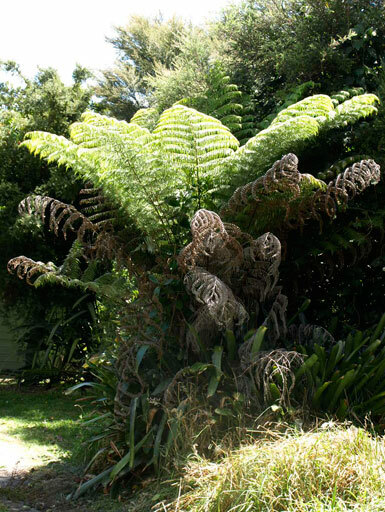 PPN: *Ponga (Tree ferns, especially of the family Cyatheaceae). 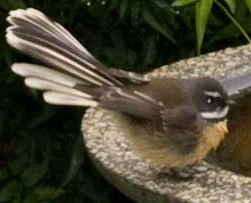 Note: The Rarotongan ponga was introduced from Aotearoa, along with its name, comparatively recently. ["Tara-ao who broke the ponga into pieces". M&G 2233]. It refers back to a story about an internecine feud between brothers, one of whom, Tara-ao, escaped through a tunnel from his fortress when it was about to be overwhelmed, and had to make do with the most meagre fare in order to survive. I’ve figured out Pinepine finishes with by stating the belief that the two exit channels of Awa-rua harbour were the source of both bad and good things in Aotearoa. Then there follows a metaphorical example of each: first with a nightmare vision of the tribe’s waka arriving from Awarua and them being almost annihilated, but eventually, in good time, (Tai-a = like the tide, not Toia = haul) things change for the better, as our famished tribe, still in the image of a waka, first nibble at sand where there are only tiny gritty crustaceans, then force down some bitter ponga pith, then the more palatable monkey-tail fronds, then delicious huhu grubs, and finally exquisitely steamed young greens full of vitamins: a long-winded but very expressive way of saying Ka Mate; Ka Ora! Further information. Almost any work on New Zealand plants and trees, or gardening in New Zealand will mention the ponga. Useful information and more pictures can be found on the New Zealand Plant Conservation Network's website, and there is interesting information on its medicinal uses (and such potentially lethal ones as providing poison to put on the tips of spears), along with more photographs, on the Auckland University's School of Biological Sciences website. Photographs: All the photographs on this page are of ponga in Te Mära Reo..